Until recently the reference that reproduced sound was measured against was a live performance, because historically live performances were the way most people listened to music. But today most people listen to music via portable devices using earbuds or headphones. Which means the references have been inverted, and today live performances are judged against reproduced sound. And that is causing a major problem: because reproduced sound differs significantly from that heard in a live classical concert: earbud/headphone sound is louder, has better bass transmission and the sound image is binaural - inside the head - rather than stereophonic - outside the head. This variance between live and reproduced sound may well be a significant factor in explaining why classical music is struggling to engage with contemporary - particularly young - audiences: because audience engagement is the name of the game, and subjectively the sound a newcomer hears in the concert is less engaging than they hear via earbuds or headphones. Many, including me, will argue that the sound of a live concert is 'right', and earbud/headphone sound is 'wrong'. But this debate is not about right and wrong. It is about whether classical music is going to recognise and accommodate changes in audience expectations, or whether it is going to ignore these changes and remain a museum of sound perpetuating late-nineteenth century sonic conventions. As has been described here in the past, sophisticated digital sound shaping technology - which is not the same thing as the much-derided amplification - is available and affordable, and works such as Jonathan Harvey's String Quartet No 4 and 'Speakings' for orchestra call for score-specific sound shaping. However, to date the compelling argument against reshaping the sound of a classical concert for 21st century audiences has been that it is an all-or-nothing process that destroys the historical reference of a 'pure' live sound and alienates the vital core audience. But I use those words 'to date' advisedly; because a new development could make listener-specific sound shaping available in live concerts, without destroying the 'pure' unshaped sound for the many who do not want their music up close and personal. 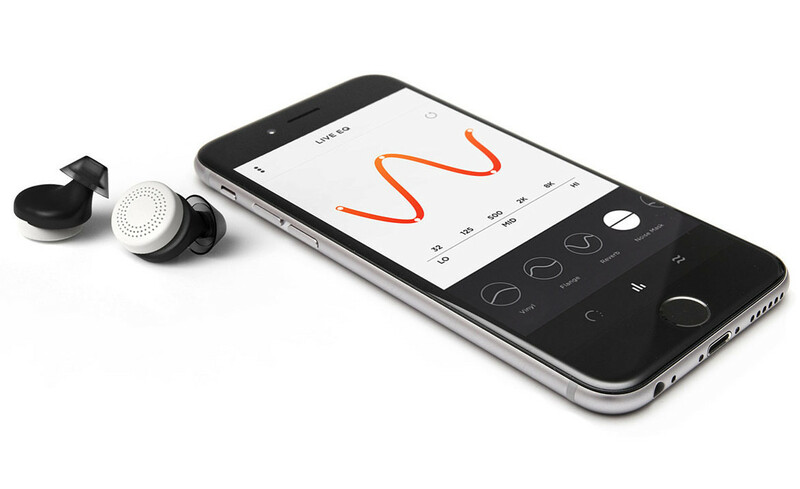 Technology start up Doppler Labs is beta testing their clumsily named 'Here Active Listening' system. To quote the company, these smart earbuds "puts a computer, speaker, and mic in everyone's ear... with the primary goal of... enhancing the sound of live performances, custom tailored to the listener's own preferences and perspective". Basically, the Doppler system uses a microphone, tiny computer and earbud to manipulate live sounds; giving the option of changing loudness and frequency response (equalisation), plus a whole range of further sound shaping options including flange, reverb, delay, fuzz, and bitcrusher. All these effects can be controlled via a smart phone app. The header photo shows the Doppler smart earbuds, and there is a more detailed description via this link. If we accept the argument that classical music needs to meet new audiences partway, the Doppler technology offers intriguing possibilities. Newcomers at classical concerts could be offered the loan of pre-programmed smart earbuds, allowing them to experiment with preset sound shaping such as bass boost and compression, together with the option to personalise the sound. Sound leakage should not be a problem as the Dopplers are near zero latency (no time delay), so peak levels on the earbuds would only be reached when the live sound in the hall reaches peak level. Anyway, to minimise disturbance to non-users, a section of the auditorium seating could be set aside for Doppler users. This post is simply intended to start a conversation about the future of concert hall sound. The classical music community has enthusiastically embraced a fundamental technology and lifestyle driven change from the legacy physical media of CDs to online music streaming; yet it is puzzlingly reluctant to discuss any possibility of a similar technology and lifestyle driven change in the concert hall. Personally, I would be much happier without even non-intrusive sound shaping in the concert hall. But times and audiences have changed and, whether we like it or not, the reference sound has also changed. We need to be more open-minded about introducing new technology into the concert hall. My theory is that offering and promoting Doppler sound shaping could attract a whole new audience; but once those listeners are in the hall they will very quickly realise the sound is more engaging without a smart earbud in each ear. Job done. My thanks go to reader Paul Dickens for the heads up on smart earbuds; I have no connection whatsoever with Doppler Labs. Header images comes from Doppler Labs via Hollywood Reporter. Any copyrighted material is included as "fair use" for critical analysis only, and will be removed at the request of copyright owner(s). Also on Facebook and Twitter. I would end the conversation before it starts by pointing out that the classical music concert hall is already a museum piece. Your rather liberal suggestion that times and the reference sound have changed and we must be open-minded about new tech is confounding. Whereas colorizing black-and-white movies is an abomination to auteurs but embraced guilelessly by general audiences, alteration (not the same as refurbishing) of other historical arts media betrays what they are fundamentally. There is no controversy when applying new tech to new artistic expression, such as with Jonathan Harvey. However, I have doubts that hybrids will attract audiences as much as newly imagined forms without so much historical baggage. From an even wider perspective, abandoning the sensorium (e.g., natural sound) in favor of supplemented or virtual reality is very much the direction the culture is going as enabled by technology. But it’s not salutary. Encouraging ideation (substitution of facsimiles and our ideas about things for the things themselves) has the paradoxical result of furthering alienation from each other and what truly exists. There are no actual superheroes. And it isn’t limited to sound originating inside the head -- we increasingly lose touch with reality and project falsity onto it. Thank you Sir for this contribution. I personally think the device you describe could as well fit those who come late at a concert. Once it happened to me (under really bad circumstances) and while the staff tried to me let me in during an intermission, they could not. So I spent the whole first act of Gotterdammerung in front of a TV set in a room with very poor sound. By the end of it, the room was crowded, and I was intermittently disturbed by loud people. On the other hand, it happened also that I was disturbed in a hall - so repeatedly annoyed that I stepped out (without noise) and chose to follow another opera in the TV room! That was not very clever. A well-equipped room would be a good consolation for those who paid 6 times the price of a DVD. A well-equipped TV room would be in my opinion a good solution to better enforce that the audience is not disturbed by latecomers.